After BLACK SABBATH and JUDAS PRIEST came from the city of Birmingham, many names appeared, but not as relevant as both of them. 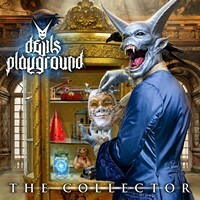 Even today, some bands still come from those lands, and DEVIL’S PLAYGROUND seems to be tracking the way of the success, as their latest release, “The Collector”, shows. Their musical work is based on a modern and aggressive form of music, following the tendency of names STONE SOUR and DISTURBED, with the use of catchy melodies in the middle of an abrasive instrumental. But they have a different feature: the melodic voices are done by Leanne, and the male vocals are guttural, creating a very good contrast. Yes, they’re a very good act, and really deserve to be known. The production of the album was done in a way that could sound clean and modern at the same time, to make the aggressiveness and melodies clear for the listener. And they hit the target, using a set of instrumental tunes that allow such blend in a very good level. During the eleven tracks of “The Collector” no one will be bored, for all of them are amazing moments. But the brutal greasy approach of “Mr. Afterdark” (very good chorus, and great duets of female and male voices), the nasty modern melodies of “Epilogue” (with guitar riffs that reminds a lot those used by Finnish Melodic Death Metal School), the catchy slower tempos of “Cross the Line”, the amazing melodies of “Time to Die” (very good bass guitar and drums presence), the crushing weight of “Unlost”, and the greasy and oppressive ambience of “Emergency” are evidences of a new excellent name that is rising from UK to the world. DEVIL’S PLAYGROUND can sound too modern for some Metalheads, but “The Collector” came to defy the musical conceptions of many. Listen to it and become a fan. 3. Are You Ready to Play?